Some advertising inside free apps for smartphones pose a threat to consumer privacy, according to a company that makes security software for mobile phones. More than 50 percent of free apps embed advertising in their offerings provided by ad networks, according to Lookout Mobile Security. Some of those networks access personal information on the phones they're running on without clearly explaining what they're doing to users, recent research by Lookout revealed. It also noted that 5 percent of the apps on smarktphones, which represent 80 million downloads, are embedded with "aggressive" ad networks that perform "non-kosher" acts on a smartphone, such as changing bookmark settings and delivering ads outside the context of the app they are embedded in. 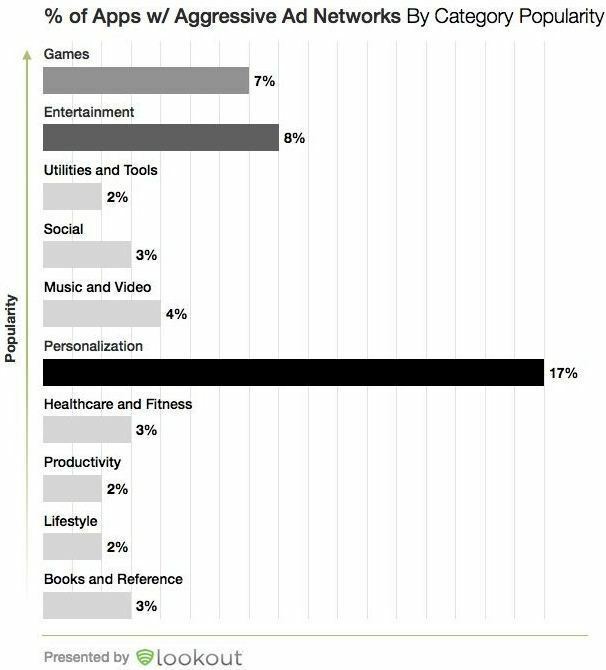 An analysis of free apps in GooglePlay showed that the leading user of aggressive ad networks was personalization apps , like wallpaper apps (17 percent), followed by entertainment (eight percent) and games (seven percent). Lookout makes a free app that can downloaded from GooglePlay that identifies what ad networks are running on a phone and what they do. The security vendor has also released a set of comprehensive guidelines for mobile advertisers. They outline "best practices" for the pitch firms to follow and govern transparency and clarity, individual control, ad delivery behavior, data collection and other topics. In addition to collecting personal data from smartphones, ad networks have also been reported to push "scareware," such as battery upgrade warnings, and shove marketing icons onto a phone's start screen or advertising into its notification bar.